Waterfront Cottage situé dans la colonie privée d'été de Mere Point. Bien soigné tout en conservant le charme démodé (1909), 3 chambres à coucher-5 couchages, porches couverts, grand pont et véranda fermée. Pelouses et jardins bien entretenus avec des bois derrière. Terrains de tennis, Aire de jeux. Sports nautiques. Marina locale (Paul's) est juste sur la route et fournit des homards, services de navigation, carburant, etc. Nouveau lancement de bateau de l'état du Maine (libre) juste à l'extérieur des portes de la colonie. Les attractions de Brunswick incluent le Joshua L. Maison / musée Chamberlain (renommée de la guerre de Sécession), Musée Arctique Peary-MacMillan des Collèges Bowdoin et Musée d'art Bowdoin avec des expositions de classe mondiale de reliefs assyriens et d'artéfacts grecs et romains. Le Maine State Music Theatre propose des spectacles professionnels de Broadway au Boward's Pickard Theatre. This is our second year at this authentic Maine cottage and we once again had a relaxing and wonderful time. We loved the fantastic wide open porch (where we ate most meals and enjoyed seeing the great range of boats go by), the friendly community members, the swimming dock, the wildlife watching (lots of birds, a deer, etc. ), proximity to Brunswick and so much more. If you’re looking for a true Maine cottage of the kind that is increasingly hard to find, this is your place! And, the Tuckers are really nice people to deal with! We absolutely loved our stay in Mere Point. The Tucker's are wonderful people. We couldn't have asked for a better vacation. We loved looking for sea glass in the cove and watching the sunsets from the point. We look forward to coming back next summer!!! We had a wonderful week. We spent time on the porch watching 2 eagles every evening. We also enjoyed kayaking, walk each evening to see sunset and sightseeing in the area. The cottage was charming and very comfortable. Can wait to go back!! The charming cottage was comfortable and roomy enough for our family of four, plus our dog. The setting was serene, and the coastline beautiful. The cottage was perfectly situated for exploring the many area attractions. We hope to stay again next year! Fab Cottage with Gorgeous View of Ocean! Very responsive and kind owners, well-maintained cottage with an awesome wrap-around porch with amazing view of the ocean!! Outstanding location! The kids loved sitting on the large porch steps and watching the fishing boats go by. We spent most nights eating dinner on the porch with the water as a back drop, using the outdoor grille. Plenty of kitchen utensils for cooking. 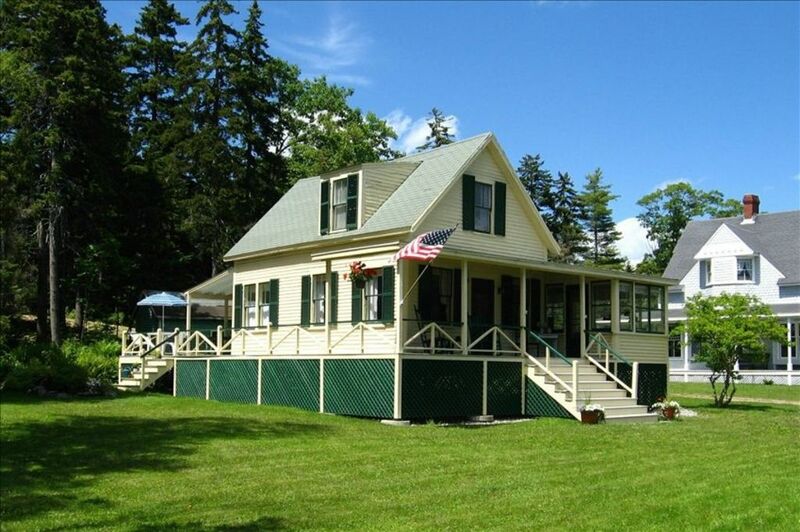 The home has Maine cottage charm, with telescope and books about sailing/fishing. We would walk down to the end of the point in the morning when the tide was out, to search for rocks and shells, a favorite activity for the kids. A playground, tennis, and basketball are a short trail walk behind the house (less than a minute). Paul's marina, down the street, has awesome sandwiches, 'penny' candy, and a view of boats docking at the marina. Six miles de Bowdoin College et du centre-ville de Brunswick.